When spring arrives, I am thrilled when I can open all of the windows to let a mild fresh breeze flow through the house. Now is the time to use up all of the left over shredded vegetables kept at the ready for the long season of winter baking. Carrots, zucchini, and squash and other veggies are all good candidates that can be thrown into spice cakes, quick breads, and muffins. This weekend, I hoped to use up all of our remaining stash. Meagan had shredded and packaged loads of carrots last fall and there were a few left over packages that would be great for this recipe. Springtime Carrot Cake is a moist, sweet, and spice-filled cake that tastes even better the second day. For this cake, I take frozen shredded carrots out of the freezer and let them thaw. Having carrots prepped ahead is a real time saver. Shredded apples can be substituted for part (or all) of the carrots for this cake. Either way…it will be absolutely delicious. Use my Vanilla Cream Cheese Frosting recipe to top this gem of a cake with a swirl of extra creamy sweetness! Heat oven to 350 degrees. 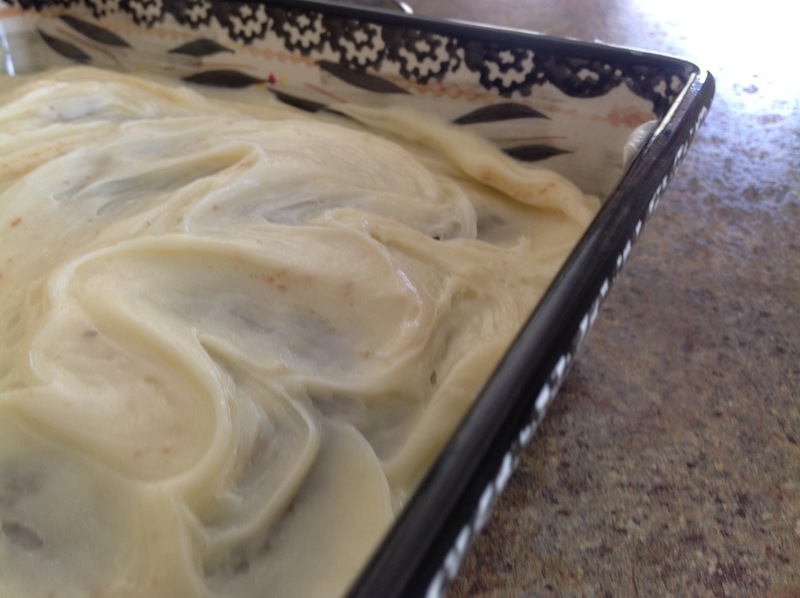 Grease a 13×9″ baking pan. Mix sugar, oil, and eggs until well blended. Stir in dry ingredients. Beat for 2 minutes. Stir in carrots and nuts. Pour into prepared pan. Bake 35-45 minutes. Frost with Vanilla Cream Cheese Frosting if desired. Beat first three ingredients in a bowl until smooth and creamy. Carefully add powdered sugar, one cup at a time; slowly mixing after each addition, until smooth and of a spreading consistency.